Rosenfeld Injury Lawyers LLC represents people with post-surgery injuries caused by medical malpractice from surgery including replacement hip and knee implant procedures and other types of professional negligence. Our law firm has extensive experience in resolving cases for our clients who have required revision surgery after receiving the defective implant that was recalled or has known severe side effects and complications. For many men and women, undergoing a total or partial hip replacement surgical procedure is a viable solution to their arthritic condition or traumatic joint damage. This surgery replaces all or a portion of the joint's ball-and-socket with a mechanical device manufactured with plastics, ceramics or metal. The prosthetic device when functioning as designed restores hip movement that lasts for the expected lifetime of the artificial joint. Unfortunately, not all hip replacement devices function correctly for the years it was designed to perform. Some artificial hips fail for biological reasons and others due to mechanical defects. 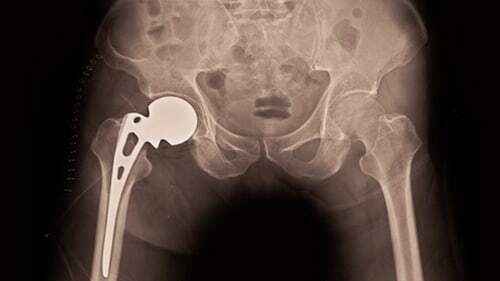 These failures often require the patient to go under an artificial hip joint “reoperation” where the surgeon addresses the consequences of the device failure in a procedure called a revision. The defective hip implant surgery attorneys at Rosenfeld Injury Lawyers LLC provide the facts posted below to assist families in making a better-informed decision list when seeking justice in taking legal action to obtain the compensation they deserve for their injuries. For many elderly patients, receiving an artificial hip replacement unit worked well because it is designed to last up to 20 years. While the device is manufactured to last over two decades, the expected lifespan of the artificial hip could be problematic for younger patients or those living a very active lifestyle. Before a revision surgical procedure is recommended, the doctor will likely perform a preoperative investigation to identify the problem with the hip. The physician or orthopedic surgeon will typically order specific x-rays (radiographic projections), MRI imaging or CT scans to detect issues with the initial hip joint components during fixation and movement postures. These tests and captured images can determine the precise extent of the femur bone and pelvic bone loss surrounding the artificial joint. The doctor might also perform a preoperative aspiration where a sample of fluid is extracted from the joint and a draw of blood that can identify free-floating metal particles and debris that could lead to metallosis (metal poisoning). A Less Predictive Outcome – Since the initial operation, you have likely suffered a loss of bone mass, muscular mass, or both. The surgeon may recommend removing and replacing only a few components of the damaged or defective implant, which might correct the problem, or not. The surgeon may detect an infection not identified through blood samples or other tests that need to be addressed before the surgical operation can be completed. Finding extensive tissue inflammation during a revision procedure might require an additional follow-up surgery after the life-threatening infection is treated. A Longer Recovery Time – Typically, revision surgery recovery time is significantly longer than the length of time it took to heal from your original implant procedure. The extended time could cause unexpected problems including the development of an infection and the need for additional post-operation rehabilitation. Developing an Open Wound Infection – Any time a doctor opens the skin to perform surgery, the patient is at risk of developing an infection at the surgical site or in the underlying tissue, bones, muscles, tendons, and ligaments. The Problem Was Not Corrected – Your revision surgery might not have corrected the initial problem including tissue inflammation, bone loss, or defective implant device. If the surgeon was not able to complete the operation successfully, you might need to undergo additional follow-up surgical procedures. The Problem Returned – Recurrence of the original problem that required revision surgery is a common occurrence in many patients. The doctor may need to perform numerous ongoing surgical procedures to address the issue that might not be curable. Metallosis Is Involved – You may have developed metallosis (metal poisoning) if your hip implant was manufactured with metal parts. If your surgeon revised your hip devices by changing out damaged metal surface components producing metallosis with other metal resurfacing components, your metal poisoning might exacerbate in the years ahead, causing significant health issues and life-threatening problems. A list above is only a small sample of all the risks involved in undergoing revision surgery. There may be additional problems from other conditions you have that your doctor or orthopedic surgeon might or might not have diagnosed before your revision surgery. Having additional medical conditions could extend the length of time it takes to recover or increase the potential for developing an infection. Metallosis (metal poisoning) is a significant problem when concentrations of chromium and cobalt particles enter the bloodstream and damage neurological pathways. Some artificial hip device manufacturers still design and manufacture their products with cobalt and chromium. However, medical science has known since the 1970s that cobalt toxicity can develop in the months and years after arthroplasty procedures, including artificial hip implant surgeries. Pseudo-tumor where the body grows abnormal tissue as a reaction to metal debris, dust or particles released by a defective artificial joint. A noncancerous pseudotumor might not be causing noticeable symptoms or pain. How Will I Know if my Revision Surgery is Failing? Many failing revision surgeries produce the same symptoms as an initial failure of the original hip implant device. You could experience one or more of the following problems. Intense Pain – The first indicator of pain in the joint site is a red flag that something is wrong. While the pain you feel might not validate an artificial hip replacement failure, it is best to ask your doctor orthopedic surgeon to check. Unusual Noises – If you underwent a revision surgery where the entire joint was replaced or only its components, there is still a potential that the device will create unusual noises. Some of the sounds include clicking, popping, squeaking, creaking, and snapping. The sounds are usually an indicator that the component or joint has become dislocated or is loose. Infection Indicators – The first signs of developing infection is heat and swelling at the affected site. To identify an infection, your doctor will take a blood sample to detect a high white blood count or the infection free-floating in the bloodstream. Joint Instability – If you are experiencing a sensation that your leg might “give out” while walking, standing, or rising from a seated position, the joint's instability might be an indicator of a failed operation. The lack of hip movement stability might also cause the sensation that the joint might lockup when in use. Odd Sensations – You might feel as though something is wrong because the joint feels “odd” or unnatural. These unusual sensations may be your body telling to see your doctor. No Symptoms at All – Oddly, failing artificial hip components and devices do not always produce noticeable symptoms. If your replacement joint or its components are causing the release of metal particles, you may be at risk of metal poisoning that could go undetectable for many months or years. The results of your blood test ordered by your doctor may show only minimally elevated levels of cobalt and chromium, but not to the point of concern. It may take many years to detect that the revision surgery failed and had caused life-threatening problems. Preventing hip dislocations by following the orthopedic surgeon's instructions. Treating infections in the body quickly by taking antibiotics as prescribed by your doctor or dentist when undergoing another procedure. Taking necessary x-rays and undergoing a comprehensive physical exam as recommended by your orthopedic surgeon might identify minimal wear and tear or unexpected bone loss that can be stopped by following the doctor's recommendations. Unfortunately, not all proactive measures can guarantee success in avoiding revision hip surgery. Some artificial joint devices have design or manufacturing defects that cause an impending failure including some manufactured by Stryker, Wright Medical, DePuy, and others. If your loved one was harmed after undergoing an initial artificial hip replacement surgery, their injuries might be the result of medical negligence or faulty medical device. You may be eligible to file a hip revision lawsuit to ensure your family receives the financial compensation they deserve to recover damages. The defective hip implant injury attorneys at Rosenfeld Injury Lawyers LLC provide legal assistance to patients who have suffered injuries after their surgical procedure. Our law firm has successfully prosecuted failed hip revision surgery cases on behalf of our clients. We provide every client a “No Win/No-Fee” Guarantee, meaning if we are unable to secure your financial compensation through a jury trial award or negotiated out of court settlement, you owe us nothing. All information you share with our law office remains confidential.